Earthquakes and tsunami that hit the cities of Palu and Donggala, Central Sulawesi Province, Indonesia (September 28, 2018) have shocked all of us where was the previous earthquake event occurred in Lombok, West Nusa Tenggara, Indonesia, in the adjacent time span. Indonesia’s geographical position in the ring of fire causes the buildings located on the earthquake path to be always exposed to the risk of damage due to the earthquake. With the type of claim that is catastrophic, the insurer must be careful to accept this risk. One of the methods applied by underwriters is by attaching the “72 Hours Clause” that has been stipulated by default in the Indonesia Earthquake Insurance Standard Policy (PSAGBI) wording. “Each occurrence of loss and or damage caused by a single constitution a single claim hereunder provided that if more than 1 (one) event shall occur within a period of 72 (seventy-two) hours as from the first occurrence, such events shall be deemed to be a single event within the meaning hereof”. Perils covered in the PSAGBI wording are stated in Article 1, “This Policy covers loss or damage to the property and interests insured directly: (1) Earthquake (2) Volcanic Eruption (3) Fire and Explosion, and (4) Tsunami”. Particularly in relation to the tsunami that caused a large wave that hit the land area, PSAGBI requires that damage or loss due to the tsunami in the form of floods and or inundation must occur within 72 hours from the first time of the tsunami. This means that if the insured object is damaged by flooding and or inundation but that events occur after 72 hours after the tsunami, the claim for damage to the building or the insured goods under PSAGBI will be rejected. Floods or inundations here have become a separate peril from the tsunami where the PSAGBI did not cover damage or loss proximately caused by flood and or inundation. 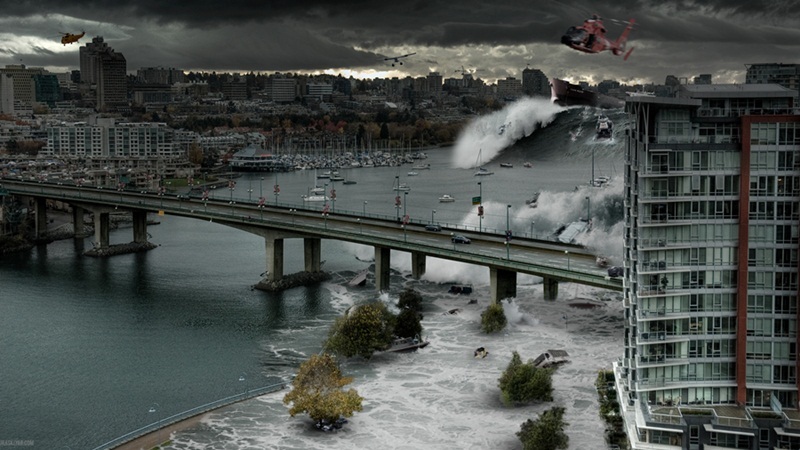 With the 72 hour clause, in the event of an earthquake or tsunami that recurs in a series of events, the incident can be considered as 1 (one) event if the last event occurs no later than 72 hours from the first event. If there is a second event, third event, and so on whose occurrence has exceeded 72 hours from the first occurrence, subsequent events are considered separate from the first event. In several other policies, the 72 hours clause was modified to explain that the events occurred after the expiry date of the insurance period stated in the policy schedule declared to be terminated. So that if the clause is 72 hours, the underwriter will remain liable up to a maximum of 72 hours after the end of the insurance policy subject to the earthquake or tsunami occur before the end of the insurance policy period. This is as stipulated by Raheja QBE General Insurance Company Ltd., India, which states, “Insurers shall not liable for any loss caused by the earthquake occurring before the effective date and time of this policy for any loss commencing after the expiration date and time of this policy. However, the insurer will be responsible for the policy, provided that the damage is prior to the date and the time of the expiration of this policy. Any and all losses caused by earthquake shall constitute a single loss hereunder provided that more than one earthquake is occurring within seventy-two (72) hours of insurance”. As a result of the earthquake and tsunami that struck the city of Palu, Indonesia, a residential building suffered severe damage. The earthquake occurred repeatedly where more than 100 times aftershocks occurred after the first earthquake. If the aftershocks occur within 72 hours of the first earthquake, even though there are several events, the whole earthquake can be declared as a single event. So when calculating the claim settlement, there will only be charged a 1-time deductible. From the above calculation, it can be seen that if a second or third earthquake occurs after 72 hours from the first event and the deductible value will be charged 2 times the compensation value is smaller than the first illustration. One of the perils with the greatest level of severity in Indonesia is the earthquake and tsunami due to the potential value for large losses. In this case, the insurance companies implement a reasonable deductible to prevent the big losses suffered by the insurer as a result of a series of consecutive and catastrophic events in a wide area.